Kayaking is one of the best and popular water sports in the world. Kayaking needs a lot of accessories like racks, paddles, seatbacks, dry bags, dry cases, life jacket, and the list is pretty long. Water shoe is another most important thing which is required for kayaking. The accessories mentioned earlier come more or less with the kayak itself. But a pair of well-constructed high-quality water shoe is equally essential for comfortable kayaking. If the motive is kayaking the whole day, wet shoes are inevitable. And those who are experienced know how difficult and unhealthy it is to continue wearing wet shoes all day long. So, with all the essential equipment, a beautiful pair of water-resistant or quick-drying shoes are very much required for kayaking. There are no specially made shoes for kayaking. But some of the best shoes for kayaking are available in the market. These shows don’t necessarily meant for only kayaking but are pretty much allowed to use during all the water sports including kayaking. Now, we are going to review some of those shoes. These are mostly known as water shoes. They must have quick-drying feature, time might vary depending on the design and other features, but the quick dry feature must exist. In our list, we have considered those shoes which are durable, has strong traction ability, are easy to put on and off, comfortable and most importantly dries fast. Let us now begin our review. 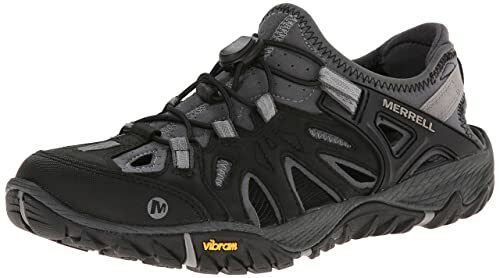 Merrell Men’s All Out Blaze Sieve Water Shoe has a very eye-catching design which in itself gives a vibe of it being a good quality shoe. It is perfect for attacking terrains. It is imported and made of leather and fabric. It has a waxy waterproof leather fabric upper which is made for forging creeks. The bungee lace not only gives it a nice look but also has a toggle to adjust and fit the shoe according to foot size. It has a synthetic sole. It has used Merrell’s UniFly midsole technology in it, which makes the midsole soft against the ground and firm against the foot. It is soft against the ground for cushioning and terrain absorption and firm against the foot for stability and agility. The efficiency of this shoe comes due to the UniFly midsole. No doubt it is an expensive shoe, but those who can afford it will hardly regret. It is worth every penny. NRS Men’s Paddle Wetshoes are made of neoprene and has a titanium laminate design. It’s high-top, and low-profile design ensures warmth and protection without bulk. 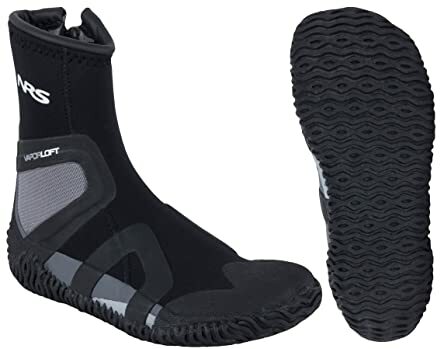 It is versatile enough to put on over barefoot, wet socks or drysuit socks. It has a 3mm Terraprene neoprene with 3 mm high-traction rubber as well as 5 mm Terraprene neoprene insole. It is tight but flexible and provides excellent traction. These are the best shoes for kayaking, surfing, stand up paddleboarding, for its VaporLoft lining. The VaporLoft lining is the prime reason for its quick drying feature. The VaporLoft lining in the shoes helps to repel moisture and increase the insulation; thus the shoes dry quickly. It has a gusseted ankle zipper closure system, and the side zipper entry makes it convenient to put on. The ankle patch is well padded, and the toe box is naturally shaped. It also has stabilizing bands. Sperry Men’s Flex Deck is imported and 100% synthetic water-friendly shoe. This durable shoe looks pretty similar to sneakers. Its shaft measures approximately 2.25 inches from the arch. The mesh uppers ensure utmost comfort and help to dry it quickly. It is lightweight and breathable. The compression molded EVA footbed increases the comfort and is removable. The outsole is made of rubber through patented son-r technology. This unique outsole and the interactive footbed provides natural sensory feedback which ensures greater stability and agility. The molded hydro grip rubber outsole with adaptive wave-sipping spreads the water under the foot and reduces slippage. It has adjustable bungee laces with toggles which are used for fit and secure wear. It also makes the shoes easy to put on and off. Even without the laces, the shoes snuggle perfectly tight, so the user doesn’t even need to adjust the toggle to tighten the shoes. 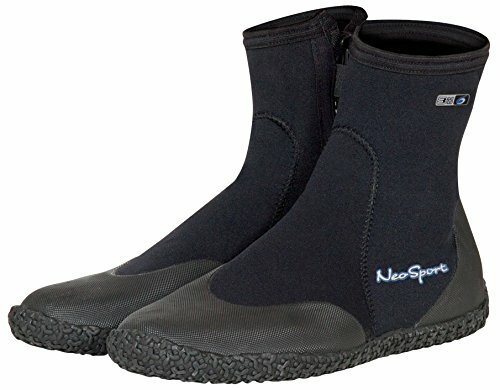 Neo Sport Premium Neoprene Boots are for both men and women. This apt shoe for kayaking and other water sports is ideal for sandy beaches, boat decks, lake, wet and muddy surfaces. These shoes offer three different types of thickness for three different types of water conditions. The 3 mm, 5 mm and 7 mm thickness is appropriate for warm water, moderate water, and cold water respectively. It is synthetic and made of neoprene. A wide range of size from 4-16 is available for both men and women. The puncture resistant sole sails pretty well throughout the rough conditions. The sole also has rugged traction for preventing slippage in wet and slippery conditions. The side zipper entry makes it comfortable to wear. The heavy-duty zipper is durable and is of #10 size. It has Water Entry Barrier (WEB) behind the zipper to prevent water flowing through the zipper. Mares Equator is a low cut tropic boot. This thick and durable boot can be used for snorkeling, kayaking, scuba diving, and swimming pool decks. It is made of high-quality fabric, and the foot pocket is made of 2 mm Nylon II neoprene. These are slip on boots. The opening is wide and stretchable enough to put it on and off easily. It is durable, lightweight and snugs to the foot pretty tight almost like a sock. As it can be used during snorkeling hence comfortably fits the fins. It has a vulcanized rubber sole. The sole is ribbed and perfect for avoiding slippage. It is also nonmarking and resistant enough to have good grip and also does not leave any mark on the surface. The blind stitch and glued construction ensure a polish look. The joining of the fabrics or materials is hardly visible. It has a tall protective heel. 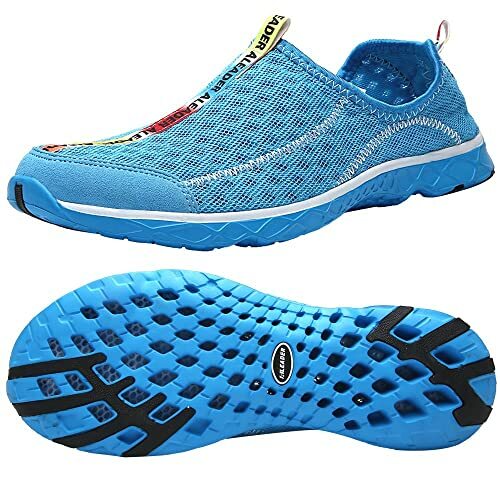 ALEADER Men’s Quick Drying Aqua Water Shoes are made of fabric and has a rubber sole. It is vegan and for outdoor-minded people. It snugs perfectly to the foot. It has a breathable and durable air mesh upper which allows the feet to breathe. The hydrophobic engineered mesh upper, and the holes on the sole efficiently ensure 100% quick drying. Drainage ports are engineered into the shoes which allow constant water flow while walking. The fluid flow technology is used for water drainage from the mesh upper to the outsole. Solyte midsole provides a lightweight and durable midsole with excellent bounce-back. Water grip and cushion outsole provide perfect traction and ensure proper performance. Rubber pods are placed in high wear areas of the outsole which provides additional traction in wet and slippery conditions. It has ComforDry sock liners and arch support insole which provides optimum cushioning performance and ensure a drier and healthier shoe environment. 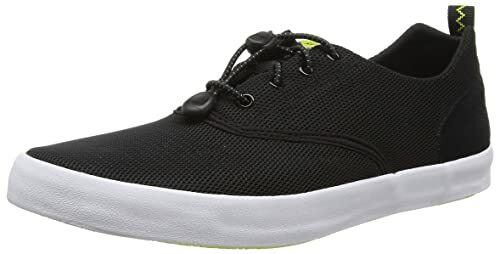 Next on the line of best shoes for kayaking is Aleader Men’s Mesh Slip-On Water Shoes. 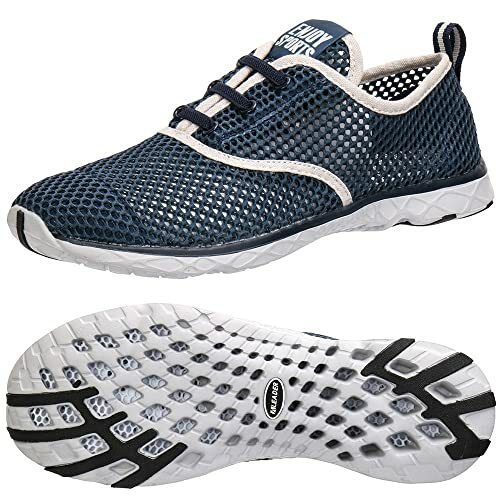 These are lightweight, flexible, stretchable, slip on water shoes. They are very easy to put on or off. They snug tightly and do not need additional adjustment if the right size has been bought. It is made of high-quality materials, lightweight mesh and midfoot webbing system. It has a rubber sole. The durable mesh upper allows the foot to breathe. Its Solyte midsole is lightweight and provides excellent bounce-back and durability. The water drain outsole offers excellent traction in wet and slippery conditions and reduces chances of slippage. The mesh upper and the hole on the sole increases breathability in hot conditions and help to dry the shoes at a short period. These are perfect for kayaking. ComforDry sock liners provide optimum cushioning performance which creates a more relaxed, drier and healthier shoe environment. This shoes from Dreamcity is perfect for water sports like kayaking and can be used as walking shoes as well. These are pretty similar to sneakers. These are made of 90% fabric and has a rubber sole. The best part of these shoes is they come in a wide range of design. Some are slip-on shoes, some have adjustable bungee laces with toggles, and some has no shoelaces. It has a breathable and durable mesh upper which allows the foot to breathe. The Solyte midsole makes it extremely lightweight and durable with excellent bounce-back. The water grip outsole makes it anti-slip and reduces the slippage in wet and slippery conditions. The sole is pretty thick hence it can be used on rock-solid uneven surfaces. It dries quickly due to its mesh upper and holes in the sole. The optimum cushioning performance provided by the ComforDry sock liners creates cooler, healthier and drier shoe environment. This Northside water shoe is designed and suitable for both men and women. It is 100% man-made and imported. It has a synthetic sole and a free-floating tongue for extra comfort. 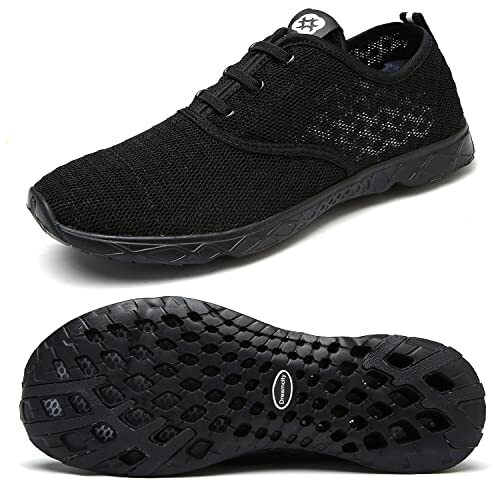 It has breathable and lightweight, rugged neoprene upper mesh which allows the foot to breathe. The toe and arch overlays are abrasion resistant. This water-resistant shoe dries very quickly, which is perfect for kayaking and longtime use. It has lightweight EVA insole which provides extra cushioning and ensures extra protection. The toe bumper provides additional protection to the toe and prevents blisters during long term use. Multi-directional rubber outsole ensures strong traction on both wet and dry surface. It helps to find the footing easily and eliminates the chances of slippage. It has bungee lacing with toggles which provide a custom fit and secure wear. It also ensures easy put on and off the shoes. 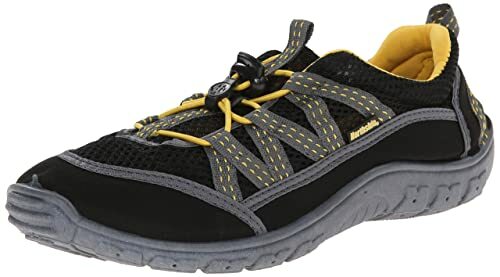 Cudas Women’s Shasta Water Shoe is specially designed for women. It is a multi-purpose water shoe. These are ideal shoes for kayaking and also can be used in everyday life. 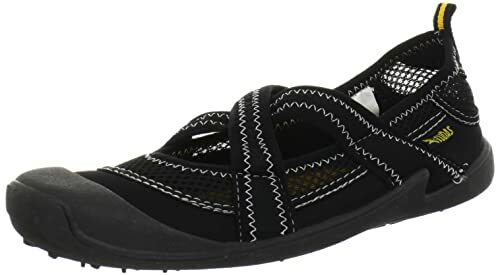 The crisscross straps add to the design to enhance the style quotient as well as provide extra support to snug the shoes against the feet both on and off the water. It is made of high-quality materials. 100% fabric and rubber sole are used to construct this shoe. It is imported as well. The mesh webbing and stretch neoprene make it breathable, fast drainage and quick to dry. The outer sole is thick enough to secure the feet on hard rocks. It is also anti-slip, grippy and nonmarking. The back pull tab makes it quick and easy to slide on and off. The toe and heel bumper ensures comfort and extra protection to the feet. Now we are going to finish the review of 10 best shoes for kayaking. Whether the prime requirement from a pair of shoes is its comfort, but for kayaking and other water sports quick drying is also equally important. All the shoes in our list had this feature and performed well while testing. The time varies, but all of them got dry pretty quick. We are emphasizing on the quick drying feature, but don’t deny the importance of other features in any way. We hope you will consider every feature mentioned in our review before buying your pair of water shoes. So, have a quick look at our review and decide which pair you need. Hopefully, you will be able to get the best one.